There are quite a few apps that attempt to automatically get rid of backgrounds from an image, or have you paint them out with a finger. Exacto, though – as its name might suggest – is all about precision. Using the pen tool, you tap out a string of blue points on the screen, which map out the outline to mask. Any point’s position can be adjusted by selecting it and then dragging anywhere on the screen. Exacto places black points between the blue points, and these when selected bend the line, so you can create a curve with two blue points rather than dozens. There’s unlimited undo, project auto-save, and a layers system for multiple selection. 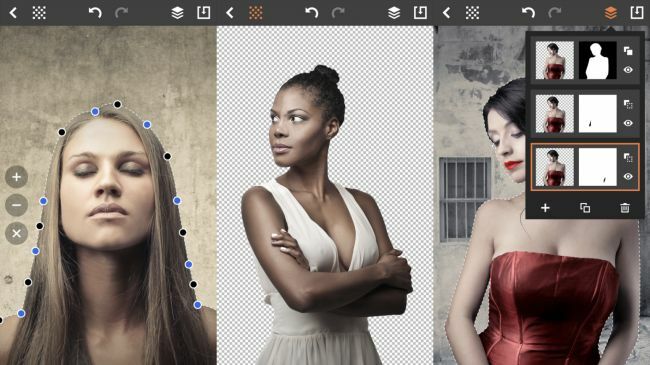 And although you might balk at the price for what’s effectively a single-feature app, Exacto is unparalleled at what it does on iPhone, and opens up scope for creative superimpositions and collages when using other creative software.